Are you ready to take your hands off the steering wheel? It might have still sounded futuristic a decade ago. Yet today, self-driving, autonomous vehicles are no longer an ‘if’, but ‘when’. Public adoption of automated cars and buses in the cities has been preoccupying some of the most gregarious engineering minds for the past few years. More and more engineering graduates are joining self-driving car teams at companies like Uber, Lyft, Mercedes-Benz, General Motors, NVIDIA, among many others. Some have come as far as developing new approaches to building the maps that most self-driving cars rely on to make sense of where they are, and what they're “seeing”. The bottom line is, whether you’re a big automotive manufacturer or a popular transportation service, chances are you not only have a development program for self-driving vehicles, you might already be testing some stages of it. Working closely with our OEM partners, like General Motors, we at Fleet Complete like to follow the autonomous ways for the prospective future. We also know that part of the innovation process is to be close to the source, and this is why we make continuous efforts to be involved in vehicle automation projects that bring us closer to action. Being a university student in an engineering program, the fancy of working on building an autonomous vehicle is high, while chances are rare. This type of hands-on experience comes to those programs that have strong investments behind them, as the costs of equipment required soars up to hundreds of thousands of dollars. 'Zeus', a stage-one autonomous car developed by a team of University of Toronto engineering students (aUToronto), tallied approximately CAN$200,000 worth of equipment and modifications that took them almost a year to fine-tune. 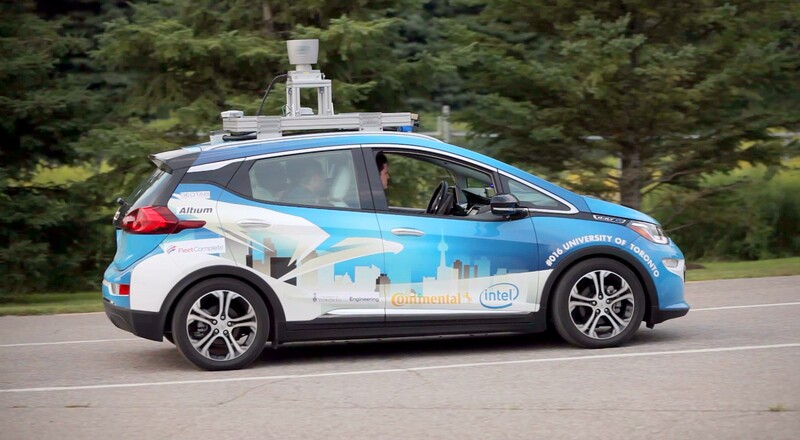 Nothing less than the AutoDrive Challenge – an international driverless vehicle competition in Arizona where Zeus got first place in stage 1 of 3, outperforming other self-driving cars from Canada and U.S. in lane following, object detection and avoidance. The aim of the competition is to build a fully autonomous (stage 3) vehicle by 2020, and today, Zeus is one of the top contenders for the winner. Fleet Complete is one of the proud sponsors for the aUToronto student team, alongside General Motors and SAE, and one of the perks (aside from nerding out) – we got a ride in Zeus! How does it feel to be in the front seat of a self-driving car? It’s a strange and exciting sensation. While knowing that it will be safe on the test course, you still can’t shake off a wary feeling towards having a computer make the all the decisions on the road and watch that steering wheel move on its own in an almost supernatural way. Something that will take some time getting used to. “So remember, this is a three year competition. It's not just one year, and the students have been so great at winning that first year. It's really a journey – to be able to create, build, and deliver a sustainable product, a fully autonomous vehicle that moves from level zero at the beginning to level three. That's no small feat,” Fong concludes. We cannot wait to see what stage 2 will bring to our champs in 2019 and will be following the action closely. The mission for Zeus this year will revolve around multiple lane change and avoiding dynamic objects like pedestrians. Smart City initiatives are sprawling all over the globe. From eliminating traffic fatalities in congested North American metropolises with the help of telematics data (Vision Zero); to Google’s urban design projects like Sidewalk Toronto that use new digital technology to re-create populous neighbourhoods; to bringing automated bus lines to the streets of Europe. FABULOS (Future Automated Bus Urban Level Operation Systems) is a 3-year project based out of Helsinki, Finland, that focuses on developing systems capable of operating fleets of automated minibuses in cities. The first step of the challenge? 16 chosen companies from six European countries – Fleet Complete Estonia among them – have formed a consortia to launch a feasibility study. In short, a study to answer the initial question of whether it can be done at all, and whether we have the necessary equipment today to make it happen. The expected output is a report describing the results of the feasibility study and the conclusions for the start of the prototype development. Once the autonomous prototypes are build, they’ll be outfitted with Fleet Complete’s tracking solution to monitor driving behaviour, routing, fuel and road tracking, maintenance, and other types of reporting used in fleet telematics today. The criteria range from fleet management and remote operation, to vehicle capabilities in mixed traffic. The bus fleet is expected to drive in high traffic areas, at urban speeds, in nearly all weather conditions and without a conductor on board. “Our aim is to mix walking, cycling and public transport to make it more attractive for people to leave their cars home – or not buy them at all. Automated minibuses could substantially improve the functionality of public transportation by providing agile last mile connections for residents,” says Anni Sinnemäki, the Deputy Mayor for Urban Environment for the City of Helsinki.